Aside from the Dawn of Man sequence in Stanley Kubrick's 2001, most cinematic accounts of the Stone Age have been relegated to B movies and comedies—from One Million Years B.C. in 1966 up through 2008's 10,000 B.C. The former, I was surprised to discover, was more than simply a showcase for Raquel Welch and her fur bikini, and proved to be a surprisingly sincere effort at depicting the lives of our prehistoric kin—even if it did promote the typical 1960s/1970s humbuggery of dinosaurs cohabiting with humans. 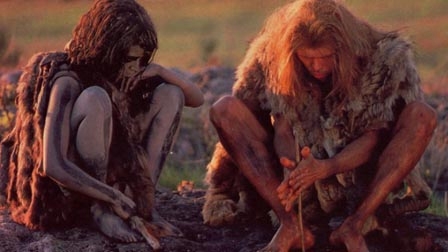 Such chronological compression reached its apex in the 1981 Ringo Starr comedy, Caveman, an intentionally ridiculous account of Stone-Age man which happened to be released the same year as Quest for Fire, a film that was its polar opposite: that is, an attempt to portray the existence of early humanity with as much realism as possible. 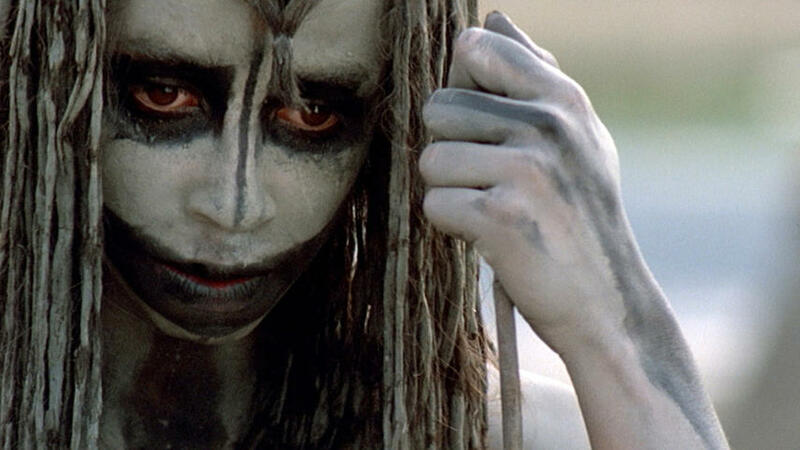 Low-budget mammoths (and minor historical inaccuracies) aside, I'm happy to report that Quest for Fire still remains the high water mark for such films, providing an enlightening—and truly entertaining—glimpse back in time that exposes our thin veneer of civilization for what it truly is. At that point I was going to bring up the remarkable performances of a cast willing to learn not only an entirely new spoken language (created by novelist Anthony Burgess) but a highly specialized—and entirely believable—new body language. I also planned to mention the director, Jean-Jacques Annaud, whose next three films would be The Name of the Rose, The Bear, and The Lover (not a bad run). And I would talk about the film's commitment to authenticity; its unsparing approach to characters struggling for survival under extreme conditions; Ron Perlman's sympathetic, often comic, turn as a sidekick caveman; and Rae Dawn Chong's more progressive (and uninhibited) cavewoman. But then, wanting to refamiliarize myself with at least part of the film, I put it in my Netflix queue for a rewatch. And what I saw upended all my good intentions. Instead of the proper widescreen version of the film—as it was presented in theaters and on DVD—Netflix is showing it cropped, i.e., with both sides of the image chopped off. So in place of beautiful prehistoric vistas dwarfing Earth's primitive inhabitants, we're left with truncated landscapes trapped inside a squarish image more common to an old TV show (the difference being, those old TV shows were meant to look that way). I compared it to my DVD copy just to be sure, and yep, the sides are definitely AWOL. Why Netflix would allow this to happen, I have no idea. As a result, I can't recommend this film for streaming. 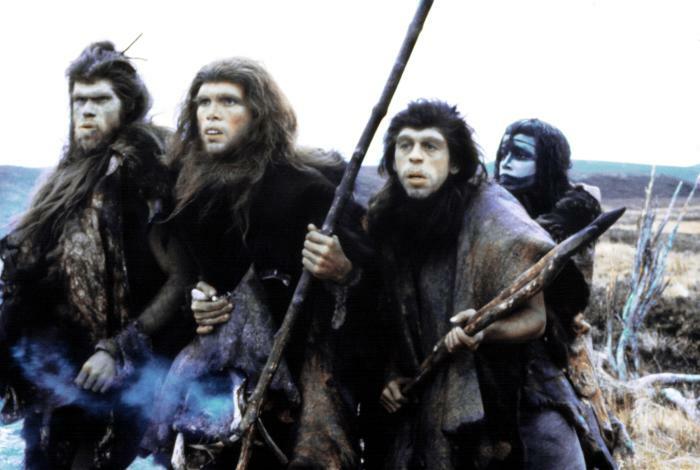 But because I think Quest for Fire, in its proper format, offers the cinematic equivalent of gazing into a wide, star-filled sky for a refreshing (if humbling) dose of perspective, I suggest tracking down the DVD and giving it a spin. The attention to detail—in the film's direction, design, and performances—remains impressive, and will make you realize not only how far we've come with our smartphones, digital cameras, and streaming TVs, but how none of those mean anything without the ability to stay dry, warm, and fed. Better than renting or buying the DVD, for only $3.99 you can rent it on Amazon Instant Video and watch it in high definition. True, that's a bit more expensive than a DVD rental, but for me...well, I've been watching (and editing) HD for so long now I can hardly stand to watch things in Standard Definition anymore. Good point. When I originally wrote this, in the early days of the blog, I was more hesitant to mention other streaming services, wanting to keep the focus on Netflix. I've become more agnostic since then.